It is my dear friend Sarah’s birthday today and this recipe is just for her. Happy birthday Sarah!! I have been lucky enough to know Sarah for the majority of my life, and Let me tell you, we have had some great times together. From birthday parties to sleepovers and late night ice cream runs to endless crafts and projects, Sarah and I grew up together laughing, playing, and enjoying life. I hope that you have a friend like Sarah in your life. 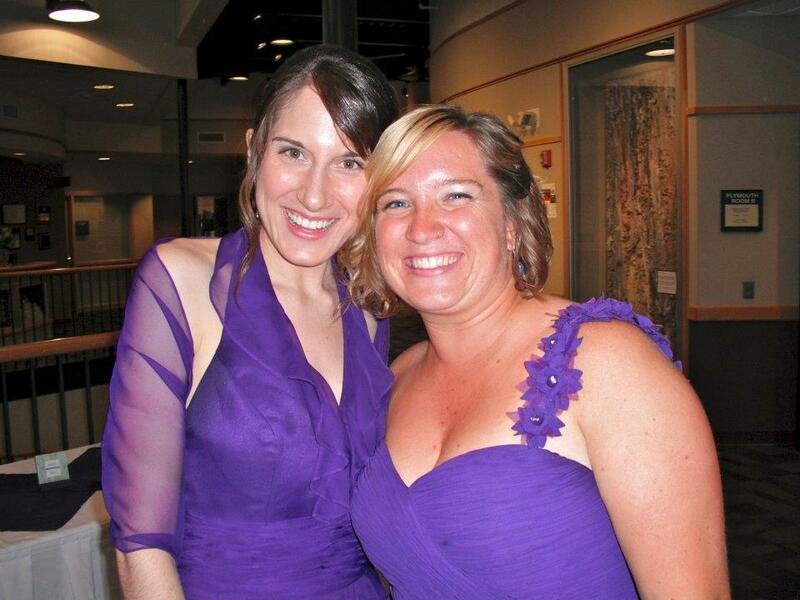 She’s that friend who will brighten your darkest days with a cheerful smile and a giant bear hug. When you talk with her, even if it has been months between conversations, it feels as if no time has passed; you can laugh at the ridiculous inside jokes from years ago, yet talk openly about your current fears and future dreams. Yep, everyone needs a Sarah in their life. I have just one question for you Sarah; are you coming, or are you a nose? For as long as I can remember, Sarah’s favorite flavor combination has been chocolate and peanut butter. I can’t blame her, that creamy rich, perfectly sweet, yet slightly salty combination is absolutely incredible. In honor of Sarah, I wanted to make something filled with this incredible peanut butter-chocolate combination. I decided upon these wonderful little peanut butter cup cookies that are just bursting with flavor. Super quick to make, and impossible to stop eating, these cookies are a chocolate and peanut butter lover’s dream. Enjoy! What’s your favorite chocolate peanut butter combination? Let me know below! Before you make your cookie dough, unwrap your peanut butter cups and put them on a plate in the freezer, this will make handling them much easier. I like to use a small cookie scoop (about 2 tbls.) to fill the mini muffin cups. If you don’t have one, aim for about 2 tbls. each. Take your cookies out at 8 minutes. They may not look fully cooked, but they will finish cooking in the pan and it makes inserting the peanut butter cups much easier. Cream together the butter, sugar, peanut butter and brown sugar until fluffy. Beat in the egg, and vanilla. Put dough in freezer or refrigerator for about 5-10 minutes. I put mine in the freezer while cleaning up my other ingredients/doing up the dishes. Using a small cookie scoop, or using your hands, create 24 balls and place each into an ungreased mini muffin pan. 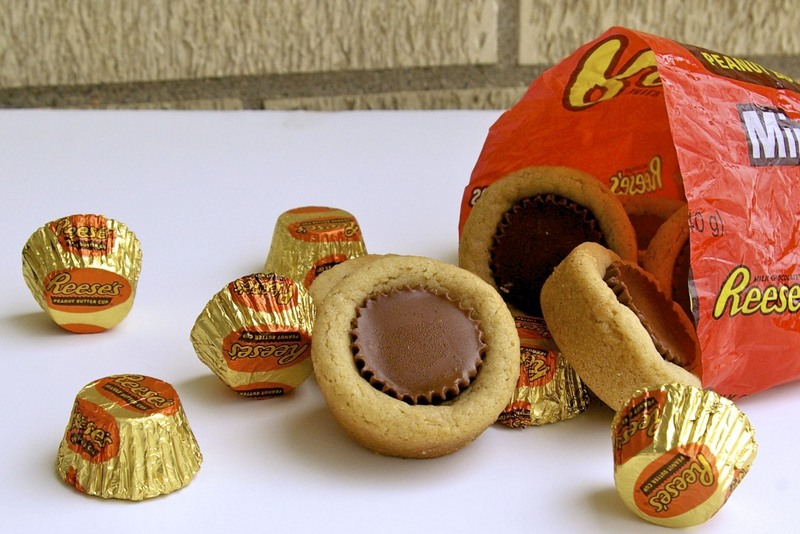 Remove from oven, wait about 30 seconds, and then press a mini peanut butter cup into each cookie. Cool completely (I often place mine in the refrigerator to speed up the process) and carefully remove from pan. I love these and that you got them coming out of the reeses bag is just so cute! soooo sweet. you're the best!! do you okay basketball?? 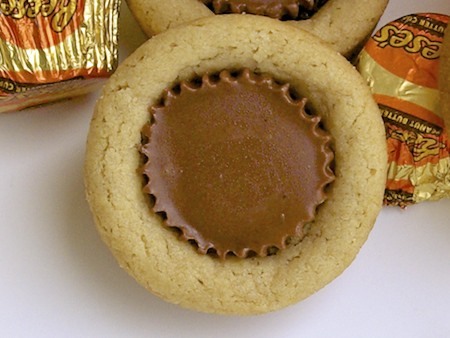 I demand you send me some peanut butter cups ASAP so I can make these. Happy Birthday to Sarah! I'll work on that 🙂 E-mail me your new address!